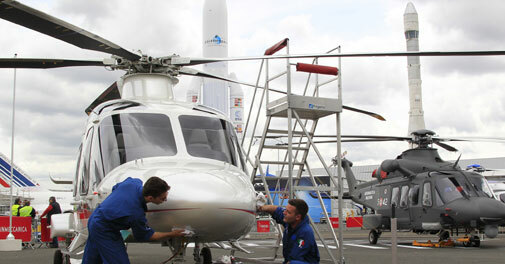 Scrapping the 560 million euro ($757.40 million) deal to buy 12 helicopters for top politicians will not necessarily lead to New Delhi blacklisting the firm, sources have said, a move some officials fear would set back efforts to modernise military. The decision draws a line under a dispute that has embarrassed the government heading into elections under a cloud of corruption scandals, and could re-open the contract to rivals, including United Technologies Corp's Sikorsky Aircraft, EADS' Eurocopter and Lockheed Martin. However, it closes a chapter of the struggle by AgustaWestland, a division of Italian defence group Finmeccanica , to keep the contract alive. A senior Defence Ministry official said there was no hope that AgustaWestland officials could salvage the deal in the meeting scheduled for Wednesday. "This is just a face-saving exercise by Agusta. But the government has already decided to cancel the deal because they have violated the integrity pact," said one of two sources in the ministry who declined to identified. A spokesman for Finmeccanica declined to comment. Under defence procurement rules, the integrity pact prohibits paying or accepting bribes. The government can cancel a contract if the pact is violated, and the seller has to forfeit any security money it deposited as a bidder. Last month, AgustaWestland called for arbitration in the dispute, but Defence Ministry sources say there is no case for this because the firm breached the integrity pact. However, under the rules, it could still take the case to an Indian court. The deal for the AW101 helicopters went off track in February after the then-chief executive of Finmeccanica was arrested by Italian police for allegedly paying bribes to secure the deal, prompting India to freeze payments to the company. AgustaWestland said last month that suspension of payment was not provided for under the terms of the contract and that Indian authorities had not responded to its requests for bilateral discussions since April. The Comptroller and Auditor General of India said in August the Defence Ministry had initially stipulated that the helicopters should be able to fly to an altitude of 6,000 metres (19,685 feet), which meant that AgustaWestland could not compete since the AW101 was certified to fly only to 4,572 metres (15,000 feet). Later, the minimum altitude requirement was lowered to 4,500 metres (14,763 feet), even though the helicopters were expected to be used in mountainous northern and northeastern parts of the country where altitudes are higher, it said. India took delivery of three helicopters before the deal stalled. Three more have been ready for delivery to India since April, three are close to completion and work has begun on the final three at the company's plant in Britain, the company said. An industry source said on Tuesday that the decision to scrap the deal came as no surprise after government last month issued a final "show cause" notice to the firm seeking to end it. "It does look like the ministry of defence is just going through the motions, that the result is pre-judged," said the industry source, who declined to be identified. An AgustaWestland spokesman in New Delhi said the Defence Ministry had demanded confidentiality in the show-cause notice, and so he was unable to comment beyond restating the company's position that there was no evidence of wrongdoing. A Defence Ministry spokesman did not immediately respond to requests for comment. Indian defence deals have been hit by a series of corruption allegations that have plagued sales agreements and hobbled efforts to beef up the armed forces, especially against perceived threats from neighbours China and Pakistan. India is the world's largest arms importer and has targeted a $100 billion splurge on defence spending over 10 years.